Ahead of the rear wheels is quite a crucial zone especially with the teams having lost the ability to seal the diffusers edge with exhaust energy this season. 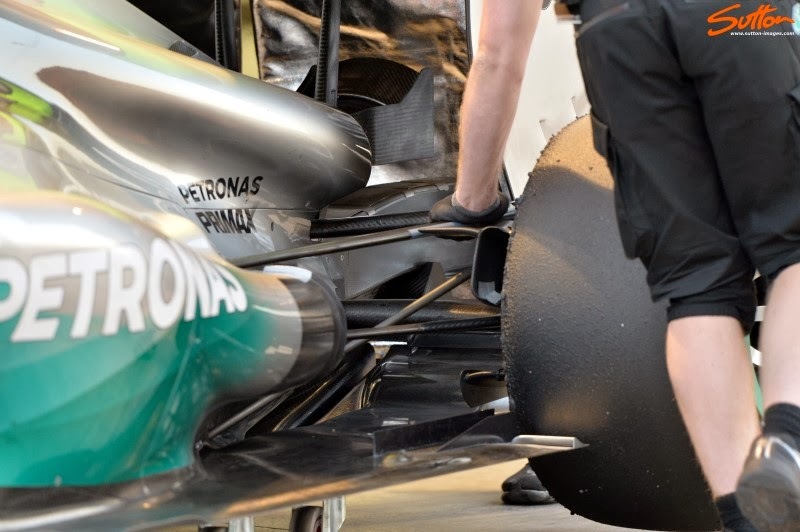 The tyre itself creates turbulent airflow that can impinge on the diffuser, something we call 'Tyre Squirt'. Even with exhaust blown diffusers a plethora of solutions to this problem were used up and down the grid last season with vertical strakes and slots being the order of the day. Having already utilised a singular curved strake and multiple floor slots on the W04 the team have clearly continued to evaluate the region. Red Bull ran with a twin strake arrangement and multiple slots for much of last year on the RB9 a configuration that we now see being tried on the W05. Flanked by sections of metal in order to reinforce the floor and stop it from flexing the strakes and slots work in combination to create vortices that try to prevent the incursion of airflow into the diffusers path by 'tyre squirt'. The length and orientation of each of these strakes and slots is carefully designed by the team in order to make them work over a wider operating window / speed threshold.